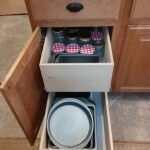 Make your existing kitchen cabinets work harder for you by replacing the current fixed shelves with custom fit pull out drawers. 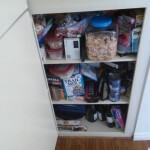 Pull out drawers or shelves increase your access to everything by fully extending out of your cabinet. This eliminates the need to get down on your hands and knees when looking for that certain frying pan. 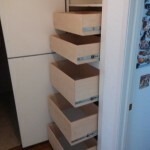 SJS Handyman has built and installed these for several of our customers. If you have an interest in spicing up your kitchen some, feel free to call us at 760-580-5224 and we’ll discuss your kitchen needs! 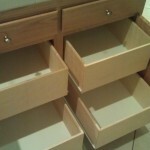 Our pull out drawers and shelves are constructed with 9-ply Baltic Birch. All the joints are glued and pinned together insuring a long lasting construction. 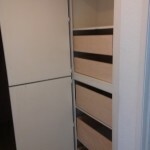 The bottom panel is ¼” white melamine which is very easy to clean. We use full extension ball bearing glides on all our pull out drawers and shelves and they are rated to 75lbs. 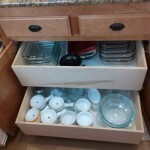 If you’re looking for pull out kitchen drawers in San Marcos or nearby, call us at 760-580-5224 or request a free quote today. We’d be more than happy to assist you. See what people are saying about SJS Handyman. Read testimonials from our many satisfied customers.